I think for a short holiday break Whistler Blackcomb is a perfect destination. At Whistler Blackcomb you are in a tourist town, everything is geared toward the tourism, which is the life blood of the town. I have been looking forward to skiing at Whistler Blackcomb for a really long time. Whistler Blackcomb is world famous and I have always heard great things about it, so when Craig and Kayti were keen to do a road trip, I had an excuse to drive the 12 hours to get there from Fernie. We had 2 epic days of Powder skiing at Revelstoke Mountain Resort on the way there. We took the road less travelled to Whistler, approaching it from the north. As soon as we entered Whistler, I could see it was in a completely different league to all the other ski towns we had visited in BC. We stayed in a nice hotel close to lifts, allowing us easy access to both the Whistler and Blackcomb mountains. There is a village walk, that only allow pedestrians, is lined by all the big brands. 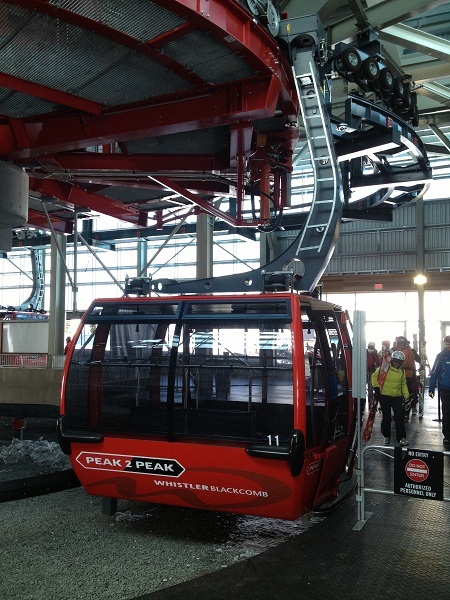 The Massive Gondola on the Peak2Peak! As I started to study the piste map, I realized we would struggle to cover both mountains in the three days I had in Whistler Blackcomb. But we gave it our best shot and had a blast, despite no fresh snow while we were there. My guess would be that much of the amazing infrastructure in Whistler Blackcomb was driven by the intense competition between the two mountains when they had separate owners. It appears that the improvements have continued since the consolidation. It is going to be interesting to see if it continues on this track now that the incentives have changed. Whistler Blackcomb is by far the biggest resort we’ve skied in Canada. It compares very well with the big European resorts I have been to. The town also has a similar feeling than a European ski town. The on mountain infrastructure is insane, the Peak2Peak lift was a real treat and makes getting from one mountain to the other super easy and quick. And the views of both mountains and the town is spectacular. Being such a big resort you have loads of beginner areas, many easy training runs, rail parks and some huge jumps. Not to mention some great alpine bowls serviced by super-fast quad lifts. Kayti had the best penguin slide of the season down a double black mogul run. Luckily she didn’t get hurt and the crowd on the lifts even cheered when she got up! The restaurants on the mountain are huge and reminded me of some of the big cafeterias in Austria. I really loved the free Wi-Fi they offered on the mountain. All in all we had three great days of skiing in Whistler Blackcomb. It would be really awesome to have some fun in fresh snow, and get a chance to see more of the resort. 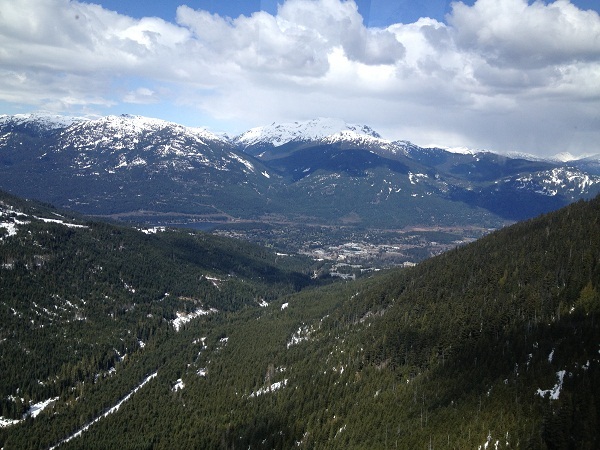 I think for a short holiday break Whistler Blackcomb is a perfect destination. I just got completely spoiled by some the advantages of small ski towns in BC, like no crowds, no lift lines and a small community. At Whistler Blackcomb you are in a tourist town, everything is geared toward the tourism, which is the life blood of the town. And I am sure around holidays the crowds show up ready to have a good time, and that means queuing at lifts, stores and restaurants. But then you get the advantage of loads of world class infrastructure and unmatched skiing area. I guess it depends on what you are looking for. Whistler Blackcomb was worth the trip for us, and I look forward to ski there again in the future! This entry was posted in Ski Resorts, Sports on 2013/05/13 by Justinus.